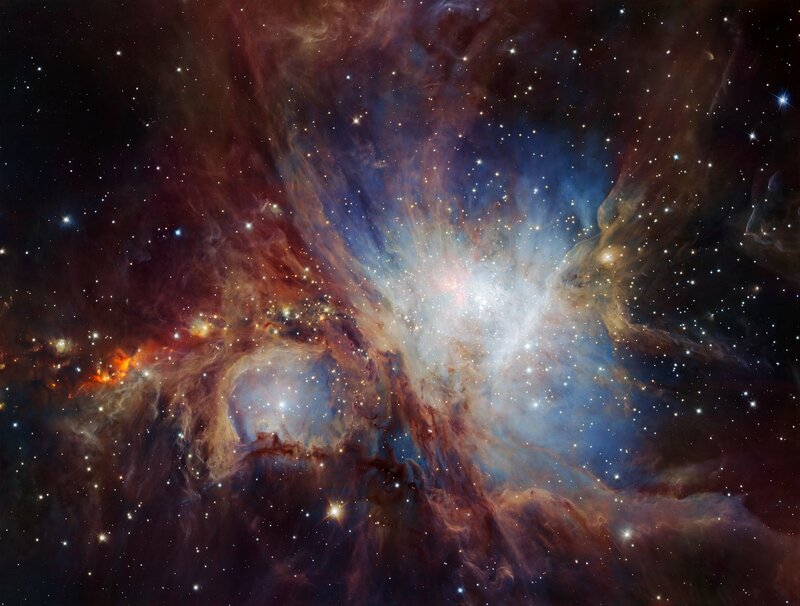 This spectacular image of the Orion Nebula star-formation region was obtained from multiple exposures using the HAWK-I infrared camera on ESO’s Very Large Telescope in Chile. This is the deepest view ever of this region and reveals more very faint planetary-mass objects than expected. Credit: ESO/H. Drass et al. ESO’s HAWK-I infrared instrument on the Very Large Telescope (VLT) in Chile has been used to peer deeper into the heart of Orion Nebula than ever before. The spectacular picture reveals about ten times as many brown dwarfs and isolated planetary-mass objects than were previously known. This discovery poses challenges for the widely-accepted scenario for Orion’s star formation history. The famous Orion Nebula spans about 24 light-years within the constellation of Orion, and is visible from Earth with the naked eye, as a fuzzy patch in Orion’s sword. Some nebulae, like Orion, are strongly illuminated by ultraviolet radiation from the many hot stars born within them, such that the gas is ionised and glows brightly. This entry was posted in Uncategorized and tagged astronomy, ESO, Orion, Orion Nebula. Bookmark the permalink.